Born October 19, 1838, at Buckfastleign, Devon. In 1871, 1881, and 1891, Thomas and Mary lived in Summersbridge, parish of Buckfastleigh, county of Devon. They emigrated to North America some time after 1883. Stewart Hansford, a grandson of Thomas and Mary, says that Thomas was employed at the Eustis Copper Mines in Capleton, Quebec. Thomas was a lay preacher in the Methodist Church in the Eastern Townships of Canada. 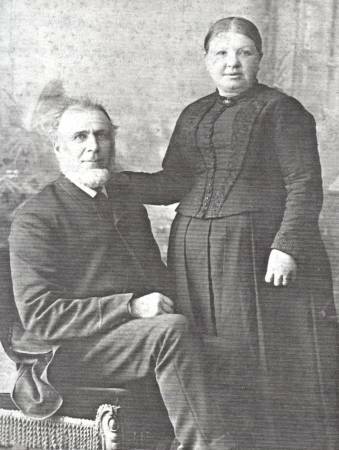 Both Thomas Hansford and Mary Foster died in Sherbrooke, Quebec. William James Hansford (b. February 9, 1862, at Summerbridge, Buckfastleigh, Devon). Mary Jane ("Jennie") Hansford (b. April 19, 1863, at Buckfastleigh, Devon; d. May 15, 1944 at East Dalhousie, Nova Scotia). Thomas John Hansford (b. December 28, 1864; d. 1948, at Ft. Fairfield, Maine). Richard Henry Hansford (b. December 23, 1866; d. March 18, 1955). Elizabeth Maria Hansford (b. July 28, 1868). Alfred Albert ("Fred") Hansford (b. May 28, 1870, at Runniford Coombe, Devon; d. October 1, 1906, at Torbrook Mines, Nova Scotia; buried at Wilmot Cemetery in Nova Scotia). Frank Charles Hansford (b. January 11, 1872; d. September 23, 1912, at Sulphide, Ontario). Florence Ann ("Annie") Hansford (b. November 15, 1873; d. June 16, 1933, at Sulphide, Ontario). Alice Ella Hansford (b. March 23, 1875). Persena Louise ("Sene") Hansford (b. September 22, 1876, at Buckfastleigh, Devon; d. at Windsor, Ontario). Edith Marie Hansford (b. January 9, 1878, at Buckfastleigh, Devon; d. 1942). Ellen Mary Hansford (b. March 10, 1879). Sidney William Hansford (b. August 18, 1881, at Buckfastleigh, Devon; d. March 2, 1930). Jessie Maud Hansford (b. January 5, 1883; d. November 30, 1969; buried at Sherbrooke, Quebec). Return to Foster Index Page.